Abstract: For many reasons, failure in education reform is rarely admitted. Even though it is incredibly hard work to try and improve the enormous and diverse American education system, because there are political consequences of admitting that a particular effort did not live up to its promises and pressure from philanthropic funders to show success, unsuccessful efforts are often swept under the rug or papered over with public relations efforts that avoid wrestling with the tough realities of educational improvement. This doesn’t help anyone. As any educator will tell you, failure is an essential part of learning. Insofar as education reform needs to be a learning movement itself, it has to be able to admit where it has failed and learn from it. Failure Up-Close engages a select group of scholars from across the ideological spectrum to examine particular education reform efforts of recent years that have not succeeded and offer lessons for school and system improvement that can be learned from them. 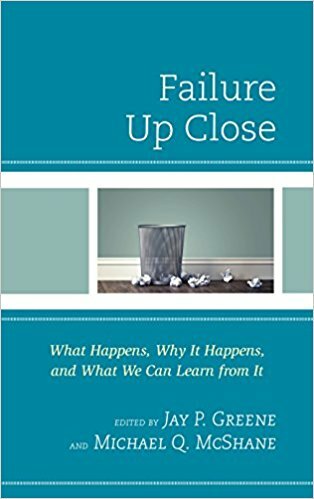 Rather than view failure as negative, this volume looks at failure as an opportunity to learn and grow. In fact, the editors endeavored to find authors that would analyze reforms for which they had some fundamental sympathy. The goal is not to bash particular efforts or castigate their supporters but rather to help those supporters understand how to do what they do better, and ultimately, do better for children.